From the author of the best-selling One Minute to Midnight, a riveting account of the pivotal six-month period spanning the end of World War II, the dawn of the nuclear age, and the beginning of the Cold War. When Roosevelt, Stalin, and Churchill met in Yalta in February 1945, Hitler’s armies were on the run and victory was imminent. The Big Three wanted to draft a blueprint for a lasting peace—but instead set the stage for a forty-four-year division of Europe into Soviet and western spheres of influence. After fighting side by side for nearly four years, their political alliance was rapidly fracturing. By the time the leaders met again in Potsdam in July 1945, Russians and Americans were squabbling over the future of Germany and Churchill was warning about an “iron curtain” being drawn down over the Continent. These six months witnessed some of the most dramatic moments of the twentieth century: the cataclysmic battle for Berlin, the death of Franklin Roosevelt, the discovery of the Nazi concentration camps, Churchill’s electoral defeat, and the dropping of atomic bombs on Japan. While their armies linked up in the heart of Europe, the political leaders maneuvered for leverage: Stalin using his nation’s wartime sacrifices to claim spoils, Churchill doing his best to halt Britain’s waning influence, FDR trying to charm Stalin, Truman determined to stand up to an increasingly assertive Soviet superpower. 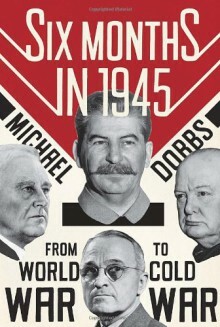 Six Months in 1945 brilliantly captures this momentous historical turning point, chronicling the geopolitical twists behind the descent of the iron curtain, while illuminating the aims and personalities of larger-than-life political giants. It is a vividly rendered story of individual and national interests in fierce competition at a seminal moment in history.